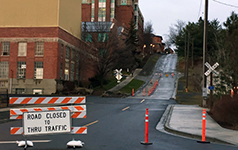 College Avenue closed between Spokane St. and Spring St.
PULLMAN, Wash. – NE College Avenue, from the top of the hill at Spokane Street down to the bottom of the hill at Spring Street, will be closed until early summer due to structural problems with the steam/utility tunnel that runs underneath it making automobile traffic unsafe. Pedestrian traffic on the sidewalks is fine. Phil Johnson, an engineer with Facilities Management and the project manager, said the steam/utility tunnel was constructed in the 1960s of concrete and rebar. Over the years, the structure has eroded due to water, freezing, age and other factors. Facilities Management crews already have begun early design work for repair of the tunnel underway. Bids will be let out in the spring, with repair work to begin as soon as weather allows. College Avenue is expected to be closed to automotive traffic until early summer.